After spending nearly a week in Albuquerque, New Mexico, at JCLC, I’m going to finish by saying this was one of the best conferences in my memory. I say that after attending and presenting at ALA, NCAAL, NCTE, and various state library associations. A week of camaraderie and relaxing among peers from across the country and whose backgrounds span almost every country on the globe. I began my JCLC experience on Wednesday at a preconference event, Beyond the Racial Stalemate where participants practiced listening and empathy skills. Most appropriately, my final session on Saturday was a workshop titled Community Building as Self Care. During that very crowded session, participants had the chance to talk, create, and plan ways to improve the situation for librarians and archivists of color. These two sessions formed great bookends for the conference. Community Building as Self Care was presented by We Here, an online community for library and archive workers of color. 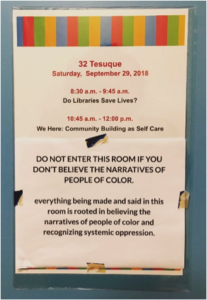 While anyone was welcome to attend the session, including those who did not identify as POC, the sign reminded every one of the importance of believing the experiences of people of color. The organizers began the session by treating the packed room to a meditation session. For five minutes, we worked on loving ourselves and looking at those who troubled us with love in our hearts for them. That beginning left us ready to do the real work that came next. I joined a group with two others to discuss a topic much too near and dear my heart, white fragility. Thanks to the preliminary meditation session, we did not descend into the “B*tch and Moan” morning it might have become. Of course, people did do a little B&M, but mostly we struggled with a search for positive things to do related to their topic. Some developed zines with ideas. Others came forward to describe the ideas they came up with. 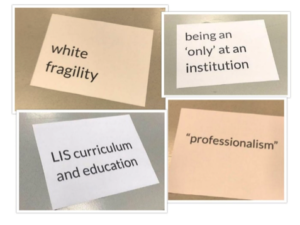 A group dealing with white fragility and white tears shared strategies to handle them and keep them from dominating the work dialog. This included using “passive aggression” techniques learned from watching some of our white co-workers. The answer for handling individuals who indulge in white tears in a professional setting they came up with, was to kindly, but firmly and boldly, inform the crier that he or she could take “all the time they wanted in the bathroom” to get over their tears. Another group described how some organizations went about recruiting people of color. Sometimes the effort involved hiring a recruiter (often a white recruiter). The result is often only 1 or 2 (or 0) POC expressing interest. Meanwhile, existing staff and para-professionals of color were ignored. They suggest efforts and funds move from recruiting people in school or providing internships that help one person at a time. Instead, take a look at existing staff members of color, individuals who are already interested in librarianship, and putting money and effort into helping them get degrees in library sciences. We Here invites any librarian of color to consider their group as a place of self-healing and community.